Should You Add LinkedIn to Your Small Business Networking? This post has been submitted by Ivan Serrano, a tech writer and photographer from San Francisco, California. Ivan has written an introduction to using LinkedIn for business – something which I’ll write more on in the days ahead. As far as professional social networks go, LinkedIn is the largest and most widely used one on the Internet. Many people view it as a tool only for job seekers, HR departments and large companies, but this couldn’t be further from the truth. Even small and local companies can benefit from creating a LinkedIn profile. After all, your customers aren’t finding you in the Yellow Pages anymore; they’re using search engines and social media to help inform their decisions. Unlike other social platforms, LinkedIn has professional prestige making it the perfect vehicle to market your small business. 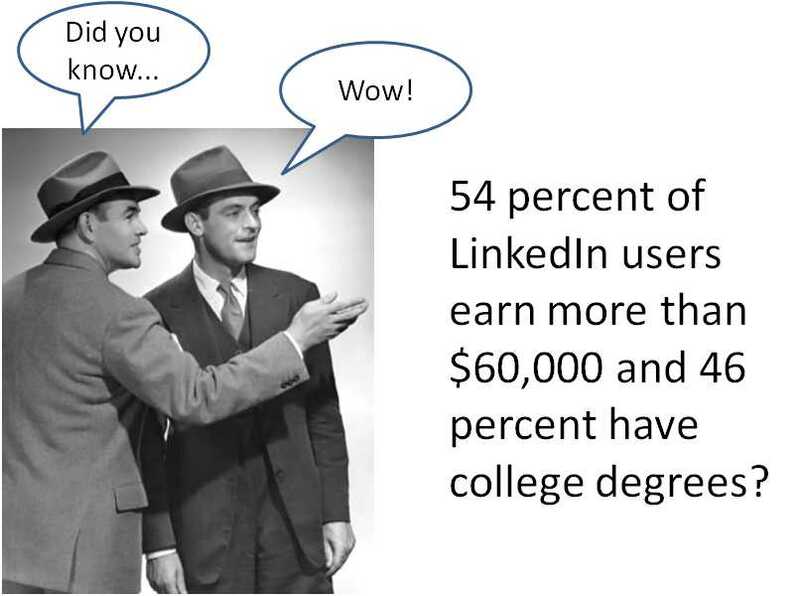 Not only that but it also offers an excellent demographic: 54 percent of LinkedIn users earn more than $60,000 and 46 percent have college degrees. If you’re new to LinkedIn, figuring out the best way to market yourself can be daunting, but the following tips should help you get started. A well-formatted and complete profile goes well beyond a simple resume. It will position you as an expert in your particular field and attract visitors. Customize your URL. LinkedIn gives you the option to personalize your profile URL to anything you want. You can use your name and even attach your industry or area of expertise to make it easy for people to find you. Use a professional photo as a profile with a photo is 11 times more likely to be viewed. Rather than using the typical headshot, try to have a photographer capture you working, whether it’s giving a presentation or speech. Use industry keywords in your headline, past experience and skills but avoid more commonly used buzzwords. The best way to do this is to perform a quick search of other people within your industry and see what words they have used and choose the best ones. Arrange your sections so they highlight your strengths and emphasize your areas of expertise. Showcase your experience by attaching work samples, including honors and getting at least 10 recommendations for the skills you have listed to improve your credibility. Although it might not be the most “social” of social platforms, the most important aspect of LinkedIn is networking. You can and should connect with friends, family, classmates, colleagues and previous employers. In order to continue growing your brand, however, you’ll need to step outside your personal group and expand into others. As with all marketing efforts, building your network is a slow process, but you’ll ultimately see great results. One of the best ways to highlight your expertise in a field is to share valuable content to your audience through your LinkedIn feed. Create content that establishes your company as the expert in your particular industry and then share this content via the LinkedIn Feed. The more value you offer, the more you will showcase your knowledge. Try to post at least 20 updates per month and include visuals to emphasize your points. Not all of your updates need to be unique but if you do share a user’s or company’s content, you should make sure to @mention them. Not only will it show that you are trustworthy for attributing the source, but it will also attract the attention of the person you mentioned. The secret to LinkedIn success is the same whether you’re a small business or a large one: establish your personal and brand credibility by building your network and creating connections. You do this by sharing valuable content, engaging in meaningful conversations and recommending others.